If you're rooting for more dramatic fights between Shilpa Shinde and Vikas Gupta, then wait. The former colleagues have put their feuding personalities at bay and are now giving friendship goals to all the contestants of Bigg Boss 11. In tonight's episode the nomination task will continue and Vikas will be asked to sacrifice his favourite jacket to save Shilpa from nomination. And apparently he will sacrifice the jacket. From his attempts to run away from Bigg Boss' house to get from Shilpa to crying in front the camera requesting Bigg Boss to take him out the show claiming Shilpa is driving him insane to tonight's episode - yes, after all the drama, when Vikas has an opportunity to take revenge, he will actually save Shilpa. Bigg Boss new nomination task is testing friendships and so far Priyank (for Hiten), Luv Tyagi (for Hina Khan), Hiten Tejwani (for Akash Dadlani) and Benafshah (for Priyank) have proved their mettle and their friendship. In tonight's episode Shilpa Shinde, Puneesh Sharma and Akash Dadlani's friendship will also be put to test. Watch this snippet from tonight's episode to get an idea of what's in store for the contestants. For the uninitiated, Vikas and Shilpa quit fighting (maybe temporarily?) after Shilpa broke down after Sabyasachi Sathpaty's exit in last week's nomination. In Monday night's episode Akash also accused Vikas and Shilpa of faking their fights to make themselves the show's focus. 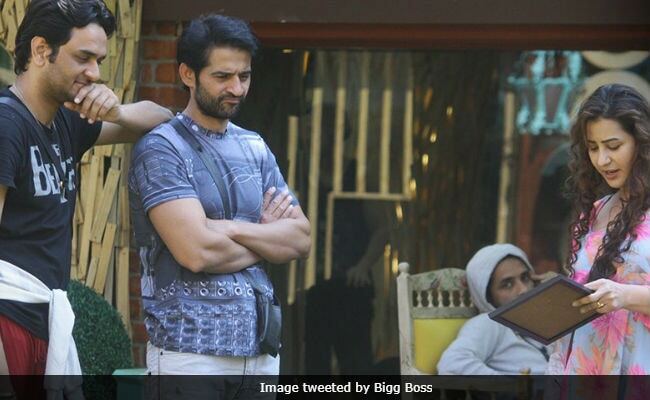 Hiten Tejwani and Puneesh Sharma instigated Akash, who seemed extremely upset with Shilpa Shinde.